NOTE: To start, click through the above images to see the progression then read below! 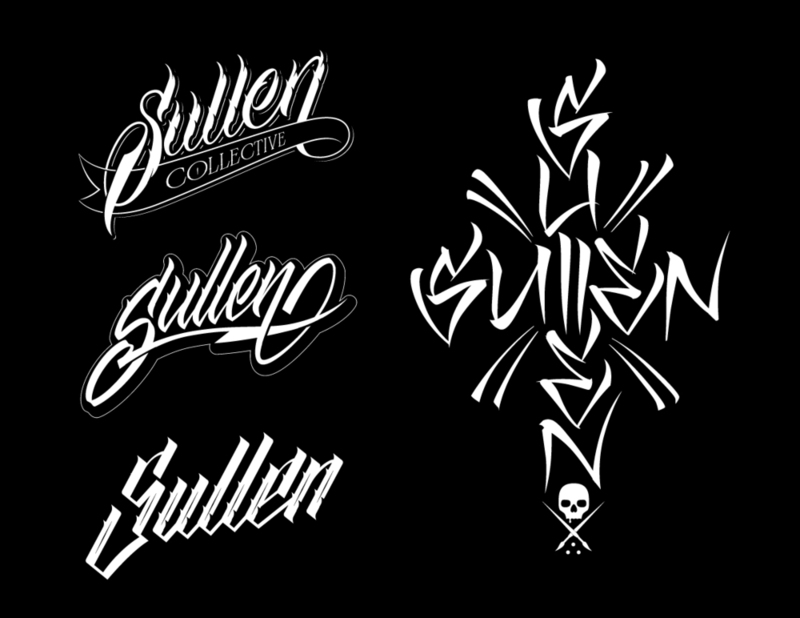 What is your process when creating custom lettering? Unfortunately there’s no easy answer here. The process or approach is determined in large part by the client (or brand) and how I feel about the brand (my mood)! 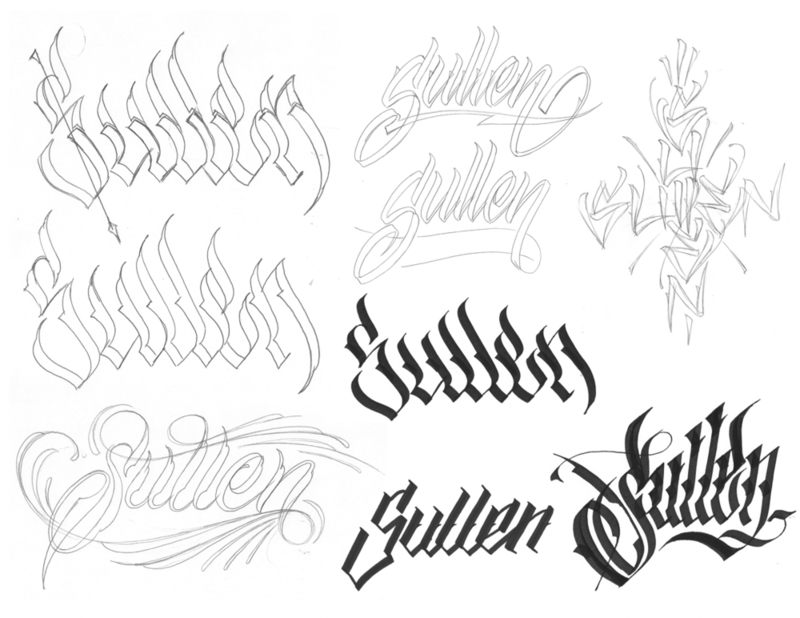 If the client is a streetwear brand I automatically think hand lettering so I start pencil to paper! If it’s a client like Harley my mind jumps to hard edges and graphic effects so... I start with a font and see how far I can customize it. Each brand brings it’s individual vibe that I consider and then there’s my mood. I literally will go against the entire grain and push in a different direction if I feel it’s necessary. I almost think it’s implied (at times) by the client. They want me to look at the brand and then go “I feel we should walk off in this stylistic direction!” They want me to interpret the brand through my creativity. As far as tools in the process I stick to the basics BUT I always introduce new tools to play with (recently added some brush pens). The standard tools are a mechanical pencil (cheap one from Target! ), a ruler, various Sharpie markers, a few microns, the mouse and the Pen Tool. Start sketching to get some basic ideas in place. This is the time to “free think” with my hand. I just let go and see what happens. The next step is to choose which sketch (or sketches) I like and sharpen them up. This is over a light table and just sharpening the kerning, line weight etc etc. After that portion is complete it’s back to “free thinking” I evaluate the piece and start to add, subtract, distort etc etc etc all in an effort to get to a point where I feel it’s done! Once the pieces are complete I start to build / develop the design work around them and just create! One thing worth noting is that each time I feel a piece of custom lettering or hand lettering etc is complete I will duplicate the piece and re-hash it! It’s almost a game to me to see how far I can take the piece in a different direction from the original while still staying as solid as the first. It’s just another opportunity to explore really! Last note: When I’m in Adobe Illustrator or Macromedia Freehand (yes I still use that program!) I NEVER use brushes. I never have! It’s just the Pen Tool!